This page is about regular concrete slabs and exposed aggregate concrete slabs. They are treated the same way. A regular concrete slab is finished by hand steel trowling, machine steel troweling, brooming, etc. A steel trowel finish would be a tighter, slicker finish and thus less absorbent than brooming or other type finish. 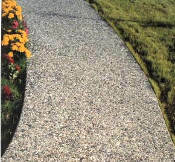 An exposed aggregate finish is created by using an acid wash to the surface of a freshly poured concrete slab to eat away the cement film at the surface and expose the faces of decorative pebbles that were used in the concrete batch. The pebbles are usually very dense (low absorption) and are now surrounded by relatively porous (more absorbent) concrete. Penetrating type sealer: for a surface of very different absorption characteristics like this, the sealer choice is best if oriented to the lowest absorption part (the pebbles). It is easy to add another application of sealer if the higher absorption part (the concrete) needs it. For a coating type sealer the absorption difference is not a concern. Both are preventable by using a "curing compound" that slows down the water evaporation process. 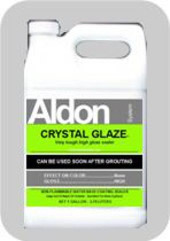 Note that Aldon Same Day Sealer provides both the sealing and the curing compound effects without any change to color or finish of the concrete. And, it can be applied any time for the sealing benefits, or the same day or the next day on the freshly poured and finished concrete to also get the curing compound benefits. If your exposed aggregate has loose pebbles and/or	"powdering" cement, then the best choice is SBS Sealer. It will create a light gloss on the pebbles, no gloss on the concrete, and strengthen the concrete and it's bond to the pebbles. The discussion on this page is oriented to the exposed aggregate type finish but both are treated the same. Unprotected exposed aggregate slabs will get gradually dirtier and dirtier over the years. It is worth considering sealing it early on to keep it looking new with simple hose washing. You have 1 of the 2 possible situations that follow. The products you need are listed in the sequence that you would use them. Click the picture to add a product to your list. #2. If the concrete slab has had a sealer applied in the past. ** If your concrete is badly stained. Regular stains are usually removed by the stripping process. Unsealed (raw) Exposed Aggregate Concrete. Note 1: A water drop absorbs rapidly. If this does not happen on your concrete it needs to be treated differently. It might have been sealed at some time and you should review this page. "Same Day Sealer" on Regular or Exposed Aggregate Concrete. This sealer is Water Base | Penetrating Type. Provides: No color enhancement or gloss. Coverage guidelines (depending on absorption) 250 to 600 sq.ft./gal. 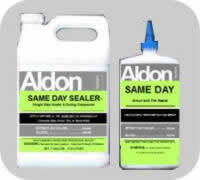 With one Application of "Same Day Sealer" there is no change to color or gloss. "Crystal Glaze Sealer" on Regular or Exposed Aggregate Concrete - This sealer is | Water Based | Coating Type. Provides: little or no color enhancement and high gloss. Coverage guidelines (depending on absorption) 350 to 600 sq.ft./gal. One application of "Crystal Glaze" provides some color enhancement and very high gloss. 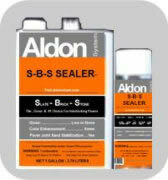 "S-B-S Sealer" on Regular or Exposed Aggregate Concrete. This sealer is | Solvent Base | Penetrating Type. Provides: color enhancement | low gloss | strengthening | efflorescence barrier. Coverage guidelines (depending on absorption) 150 to 500 sq.ft./gal. Easy Care Products: for a concrete floor. "Maintain" - for no streak wet mopping of Exposed Aggregate Concrete and all other types of flooring. You may have heard of concerns about Concrete Slabs or Exposed Aggregate Concrete. All of them would be prevented with the information we provide here. Therefore, you can have the floor you want!